Just to proof that I do still wear something other than leggings and jersey tops. An actual, decent outfit that I wore for our ‘date day’ this weekend. We went on a long walk through my favorite neighborhoods in the city, het Eilandje, to dream of apartments we will never be able to afford. While we were out, we squeezed in a quick and fun shoot so I had something to break up all of my recent travel posts. 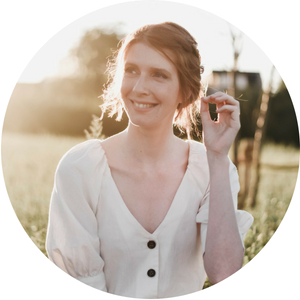 The MAS museum is a Belgian blogger favorite for outfit shoots because there’s plenty to see and do after you’ve wrapped up your shoot. K and I had coffee at what might be my new favorite spot in town and walked up to the river banks afterwards to sit and talk about our work/school week. 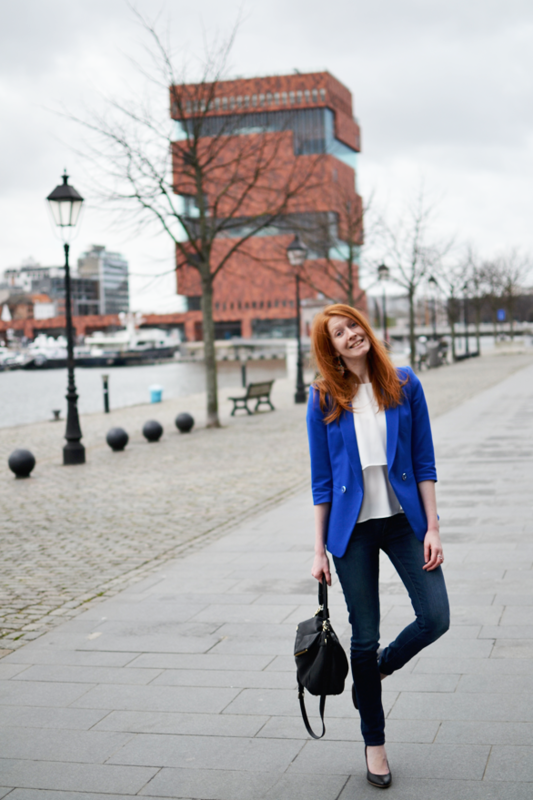 I’m planning on writing a separate post about the area somewhere in the Spring and that’s why I will just share my outfit and a touristy sight on Antwerp with you today. As a redhead I never thought I’d be known for anything other than my red hair. That was until I wore this jacket to school. My Ted Baker jacket is one of my favorite pieces and I apparently wear it a lot of Mondays and Fridays, when I have my classes. Now I’m the “blue jacket girl”. Turns out some people also know me as the “dresses + blazers” girl, but I’m not sure where that came from. I was pretending that winter was over with this outfit, but gave in to the chilly wind by going for jeans instead of the usual pencil skirt. My winter coat is lying on the ground somewhere just outside of the bottom right photo corner too. I’m just a little bit tired of my winter wear and totally ready to bring out my blazers and dresses again… oh wait… . Ohhh m’n vriend en ik doen dat ook zo graag, wandelen door het Eilandje en dromen van de appartementen daar! Echt een droomlocatie daar! Prachtige foto’s ook, jij en het MAS zijn beiden zo fotogeniek! LOL Well I think you have fabulous hair and the jacket is nice too. Sounds like a lovely date day! I love that blazer on you! I can see where it would be your staple… and your identifier! I love that your classmates know you as the blue blazer girl. That blazer looks absolutely stunning on you. With such a lovely top and dark skinny jeans, you look amazing girl! You just have this knack for looking incredibly stylish Nikki! Not sure if it’s the amazing photos (credit to your boyfriend! ), or the fact that you have fun with your photos, but you always manage to look so good! Loooove je outfit en je foto’s zijn mooi en leuk 😀 Tof! Beautiful blazer! I love that cobalt blue! Eindelijk kan ik je blog lezen 😀 het is leuk om je ook in een broek te zien jaa.. want die staan je ook super!! 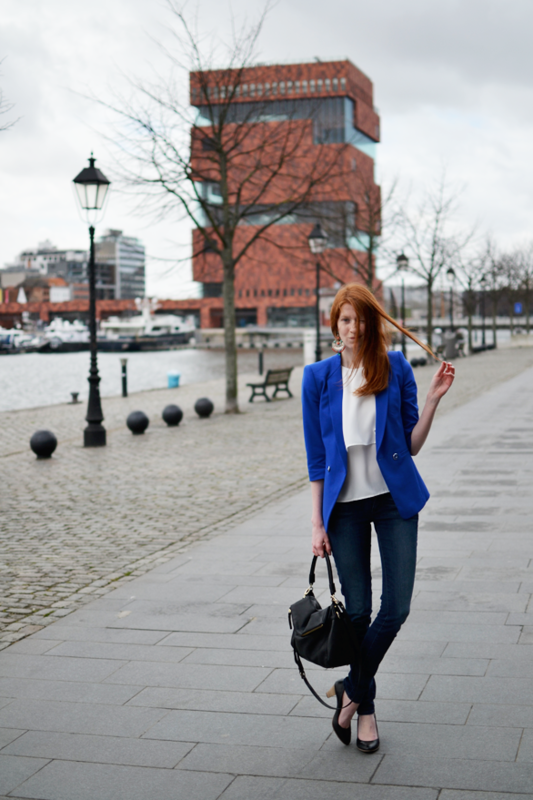 Heel classy weer ^^ Je blauwe jas en romantische bloes eronder… vind ik dan ook een prachtige combinatie! Dankje Natasja! Ik heb deze week nog één broek gekocht. Nu heb ik 4 broeken, en euh… 41 jurkjes? Haha! Staat u ZO ZO mooi! Heel schoon veste, past u echt super! Ah cool, ik kijk al uit naar je touristy post over Antwerpen. Die kleur van die blazer is en staat je fantastisch! This is SO super cute!!! Yes- that blue goes so well, and with your red hair, you look super fierce! I hope you can stop by my bloggie too. I just did an interview and style post on this awesome fair trade fashion company. Let me know what you think! I look forward to your reply. 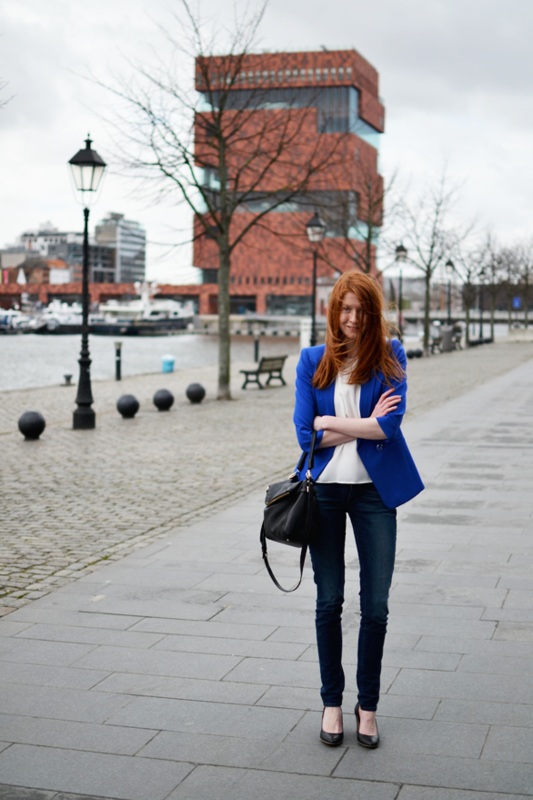 I’m loving this blazer on you, it’s such a fun pop of color! !